A very exciting opportunity has arisen to join the celebrations in Auckland of the 150th Anniversary of the Royal New Zealand Yacht Squadron (RNZYS) and the 36th Americas Cup. After 12 months of discussions with the RNZYS, the Royal Prince Alfred Yacht Club (RPAYC) is looking for potential entrants in both racing and cruising divisions and we are seeking Expressions of Interest for this exciting event from Sydney to Auckland in January 2021. Partnering with the RNZYS for the finish of the race the RPAYC welcomes offshore capable racing and cruising monohull and multihull yachts to enter. The race will see divisions including IRC racing, Superyacht and a cruising rally. Take your race yacht over and compete in the many Anniversary Regattas and events celebrating 150 years of the RNZYS or cruise in company with your yacht to get ringside seats at the Americas Cup Regatta. The Royal Prince Alfred Yacht Club is proud to announce that Henri Lloyd are the Official supplier of merchandise for the 2019 Club Marine Pittwater to Paradise Regatta. Competitors are able to order directly online and have their crew gear customised. A range of Henri Lloyd merchandise will include Hats, Jackets, Polo's, Race shirts and Shirts are available in a variety of colours ans sizes. To view and order from Henri Lloyd follow the link below. Click Here to view the apparel. Marcus Grimes is stepping into a new level of technology and style of racing with the purchase of the Judel/Vrolijk that was Elena Nova, now called Insomnia and racing from the Royal Prince Alfred Yacht Club in Sydney’s north. Working towards the 2019 edition of the annual 370 nautical mile Cat 2 Club Marine Pittwater to Paradise ocean race, and getting more sleep at home, are for now Grimes’ two driving goals. “We are conscious that we have a big learning curve ahead and coach Tom Brewer has been helping us with the new processes and boat handling. Offshore racing is what we love to do so we will continue to work on learning to drive the boat and building our capability. “I suspect it will be a while before we are too worried about results, but over time it would be nice to emulate some of Craig’s [Neil] success. For now we will just focus on getting over the finish line in the RPAYC’s Bluewater Pointscore and Short Ocean Pointscore series, trial some new crew and prepare for the Pittwater to Paradise race in January. After that we will see!” Grimes added. The distinctive grey and purple JV42, designed and first owned by former ORC world champion Christopher Plump in Europe, came to Australia for second owner Craig Neil who raced it out of the Cruising Yacht Club of Australia for many years. The quieter winter months are a great time to run a checklist over boat and crew preparation for another season of bluewater racing out of the Royal Prince Alfred Yacht Club, on the shores of Pittwater. Key to the Bluewater Series is the third edition of the annual Club Marine Pittwater to Southport Yacht Regatta starting January 2, 2019 and the club’s race director Nick Elliott has some pointers for owners and crews working towards this Category 2 ocean event. “Winter is a great time of year to think about preparation and finding competitive advantages for the upcoming offshore season, firstly this means meeting the eligibility criteria for each planned race. The New Year race to Southport requires 150 nautical miles of offshore racing with a least 50% of the planned crew and signing up to the club’s bluewater series is the ideal way to tick off this entry condition. “Now is also a good time to check Safety & Sea Survival certificates are in-date and if not, get in touch with the RPAYC’s preferred suppliers, Above & Beyond Boating at Newport and Genevieve White at Marine SafetyWorks, and enrol your entire crew or individuals. “I also encourage owners to review their IRC certificate and make sure they have optimised their rating for the best sail-plan, rather than every sail that came with the original boat purchase. Look at your wardrobe and which sails you use regularly to get best performance, and make sure those sails are on your IRC certificate - not that huge headsail that is rarely used and comes with a significant rating penalty. “For a new owner, consider that spending thousands of dollars buying a new kite or set of sails might not be the best way to gain an edge. There might be more gained by understanding the bigger picture of race navigation – performance polars, current and sea conditions, weather GRIB files, routing, and having your electronics dialled into an integrated computer system,” Elliott added. Will Oxley, one of the country’s most respected navigators with multiple laps of the world and winning navigator of Matt Allen’s Ichi Ban in the 2017 Rolex Sydney Hobart on his remarkable resume, agrees understanding navigation is integral to working out where percentage can be made - and he’s referring to fundamental navigation rather than navigating by iPhone map. “Because we have easy access to an iPhone map some assume that’s navigation, but there are so many more factors,” Oxley says. “Fundamental navigation used to be part of ocean racing because there was nothing else available. More and more are coming to me saying ‘I want to learn Expedition’ but that’s the end point. What they need to learn is navigation and tactics. Shorthanded, multihull, straight-out racer, cruiser/racer and a newly introduced cruising division offer the full gamut of entry options for the IRC/ORCi optimised through to well-performing production boats, and now those crews focused more on the journey than the destination are well catered for. The NSW coastal fringe is a dramatic ever-changing landscape of beaches, cliffs, towns, safe harbours and islands. Each January the 370 nautical mile Australian Sailing Category 2 ocean race – the Pittwater to Paradise Regatta’s opening pointscore event - takes the fleet north along the NSW coast to the easternmost tip of Australia at Cape Byron before the final leg along Queensland’s golden beaches to the finish line off Main Beach at Southport. Already registered for the start of the 2019 race to Southport, starting January 2 just to the north of Palm Beach headland, is Wings, a new Dehler 46 launched last November for RPAYC members Lindy and Ian Edwards. Wings’ racing calendar is a busy one, the owners soon to leave Sydney for the CYCA’s lengthy PONANT Sydney Noumea Yacht Race, a reinstated 1,064 nautical miler starting June 2, then back to Queensland in winter for consecutive race weeks at Airlie Beach, Hamilton Island and Magnetic Island. 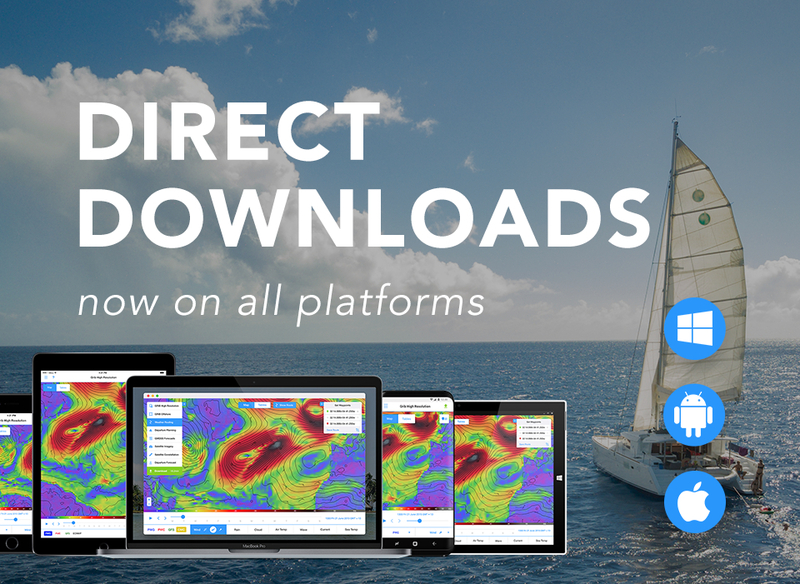 The PredictWind Offshore App now supports Direct Downloads on all platforms for weather data over a Satellite Connection. In the past (and with other GRIB viewers) you needed to send an email request, wait for the reply, wait for each individual file to be downloaded, then save and import into your GRIB viewer. Direct Downloads via satellite are as simple as if you were on a standard internet connection with the PredictWind Offshore App. 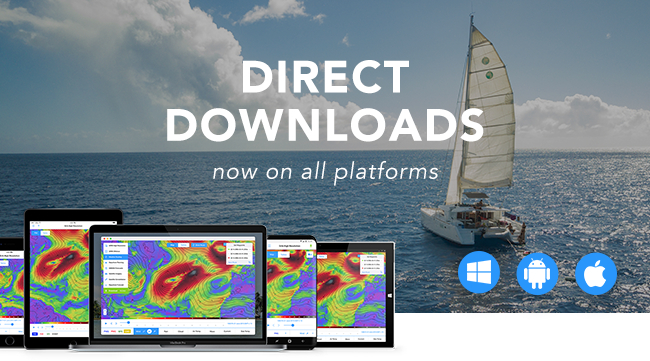 Direct Downloads in the Offshore App have been available for some time on Mac, iOS and Windows 7 but are now available on the Windows 10 and Android Offshore App. This sets the PredictWind Offshore App apart from the competition when it comes to GRIB viewers and downloads. Until Cyclone Iris sent competitors to a safe place to wait out the worst conditions, Nexba Racing was tracking well in the double-handed Melbourne to Osaka fleet. Bacon and crewmate David Sampson made for the port of Gladstone on the advice of organisers butweren’t able to return to their position within the prescribed time, due to ongoing extreme weather. Two days later, on April 6, they made the difficult decision to withdraw, 11 days into the 5,500 nautical mile challenge. Bacon was back at the RPAYC in Sydney this week when the Club Marine Pittwater to Paradise Regatta Notice of Race went live and he took the opportunity to put Nexba Racing forward as the first entry for the annual coastal race startingat 1pm on January 2, 2019 just north of Barrenjoey Headland at the entrance to Broken Bay. For the 2019 edition of the annual Category 2 passage race the RPAYC has clarified some ambiguity around what they will accept as equivalent crew experience, which is a minimum 150 nautical miles of offshore yacht racing by at least 50% of the planned crew aboard the yacht entered. Race director Nick Elliott explains: “In keeping with the club’s philosophy of supporting boat owners with ambitions of offshore racing and reducing the number of hurdles to qualify for major events we’ve established simpler pathways to gain the necessary experience in order to tackle our premier race to Southport. A second identified challenge for owners has led to the RPAYC working closely with the IRC office at the Royal Ocean Racing Club and national body Australian Sailing to understand what information is already available regarding stability data for standard boats. 2018 Club Marine Pittwater to Paradise Regatta Hailed "Friendliest Race"
The diverse fleet in this year’s Club Marine Pittwater to Paradise Regatta has hailed the event “a brilliant way to start the year” and a great reason to travel north for summer on the Gold Coast, sight seeing and some competitive sailing. Ahead of starting the P2P, Frantic made the return from Hobart, where they came 11th in their Division and 24th over the line. The P2P was their first win of 2018 and something the whole crew are very proud of. “It’s a new race and is gradually making a name for itself – it’s a great destination,” said Mick of the P2P, hinting that they would be keen to enter again in 2019. Overall winner, Ray Roberts’ Checkmate of Hollywood, came in fifth place and was unanimously admired for her looks and her performance. The legendary 40 year old, 50-foot, IOR Doug Peterson design Checkmate of Hollywood was competing in her first Australian race and after missing the Sydney Hobart due to damage on the delivery to the start line, all eyes were on this classic yacht and she did not disappoint. “It was our first Australian race, after the disappointment of missing the Hobart,” said Michael Spies. “We backed ourselves. The competition wasn’t soft. Nine Dragons is an Australian champion. It wasn’t ideal conditions for our boat, but the boat lived up to our expectations – more than! “Having run grand prix boats for 30 years, with a world champion crew, a mix of youth and experience, Checkmate was vastly different. It’s a 40 year-old timber boat, not carbon fibre. She’s a lot harder to steer, but more forgiving in motion, not as hard on the body. It was nice to have a hot meal and good sleep. We actually had an oven! It just proves the IRC rule is doing its job. Second over the line and winner of IRC Division 1, Dk46 Nine Dragons, followed Frantic a few hours later at 11.28 AEDT, but enjoyed a close battle with the TP52 in the early stages of the race. Nine Dragons’ owner, Bob Cox said his crew enjoyed “a relatively easy race, with only a few challenges when the number 4 spinnaker exploded, but the crew did a great job”. He was impressed with the fleet and the event, saying that despite the relatively small numbers, “competition was intense and you can’t beat ending up on the Gold Coast”.